The Category here is a selection of various items that are out of the normal range of items I usually buy and sell and, nonetheless, are quality examples for what they are. In the antiques and artifact business, one enounters a huge variety of marvels and oddities, so, when out of the ordinary items surface, it's best to capture them. The collection here are mainly objects from my own personal collection, and, as usual, everything guaranteed to be accurately represented. ! ! ALWAYS BUYING ! ! OD182 This magnificent carving of bone, probably a cattle bone, is a masterful artwork made for an early 20th century bronze statue and apparently, not used for the completed statue. 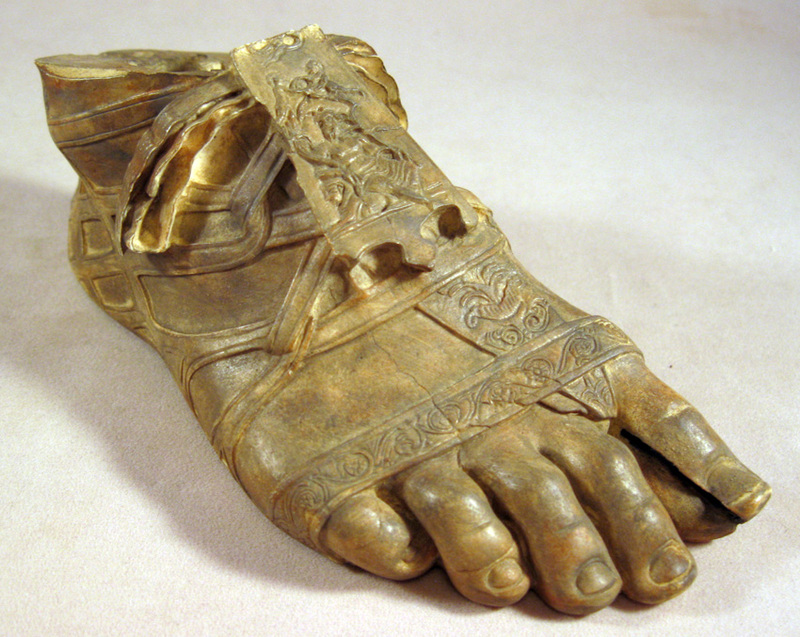 The sculpture depicts a human foot wearing a Roman laced sandal with a tied ribbon and incredibly detailed leather strappings including a lappet depicting a scene of a seated male god flanked with cherubs. A masterful carving with reception holes drilled into the upper part of ankle for attachment to, most likely, a bronze body. This is a contemporary art object circa early 20th century and measures nearly 5 1/2 inches long, 2 1/4 inches wide, and 2 1/2 inches tall. A captivating and painstakingly executed carving of the finest quality and artist signed 'MMA' on the underside. OD184 This is a small Egyptian faience mummy pendant with an aquamarine glaze depicting the lioness goddess Sek-Met who was both a goddess of both war and of healing. Pendant is intact, the upper half with surface erosion and staining and measures just over 1 1/2 inches tall/ nearly 4 cm. 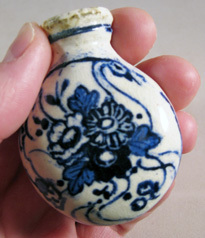 OD183 A small ceramic or porcelain vial with a white base decorated with a bold blue image of an ostrich or swan coated in large organic flower images. Quite attractive designs handpainted underneath a high gloss glaze. 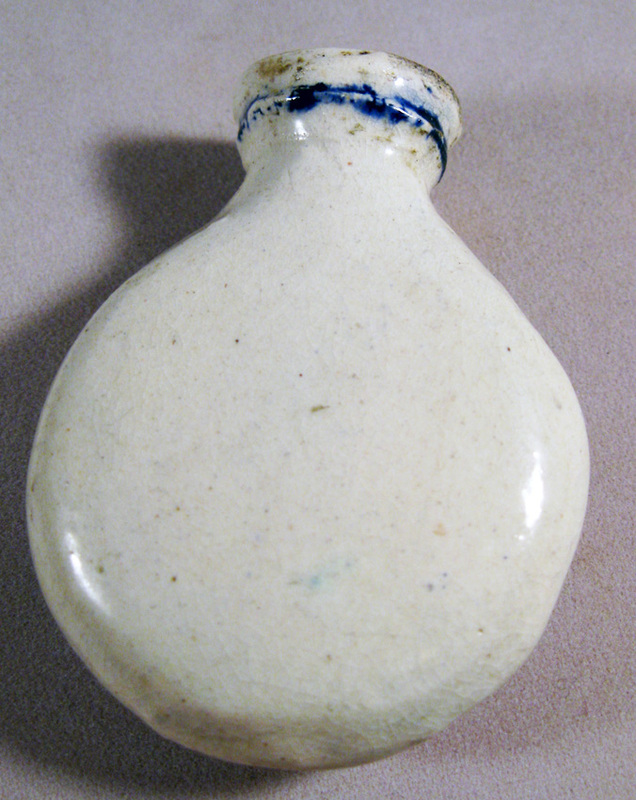 The small pocket vial appears to be a cosmetic vessel missing its top and the interior is encrusted with a dull rouge pigment, probably a facial cosmetic color. As I am not quite familiar with such pieces, I am confident this is antique, but unsure of culture; probably 19th century to 1920's A.D. at the latest, but, could be much earlier. Islamic? 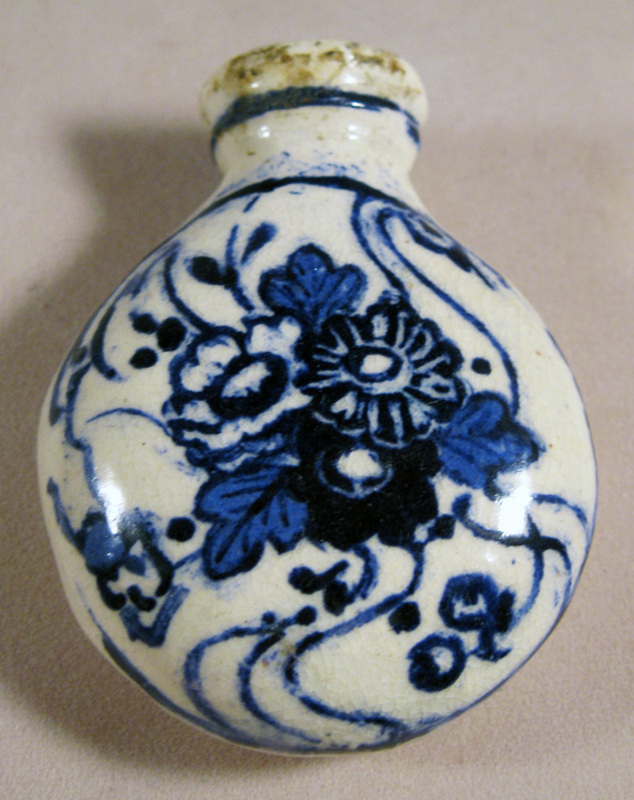 16th century China? I really don't know. 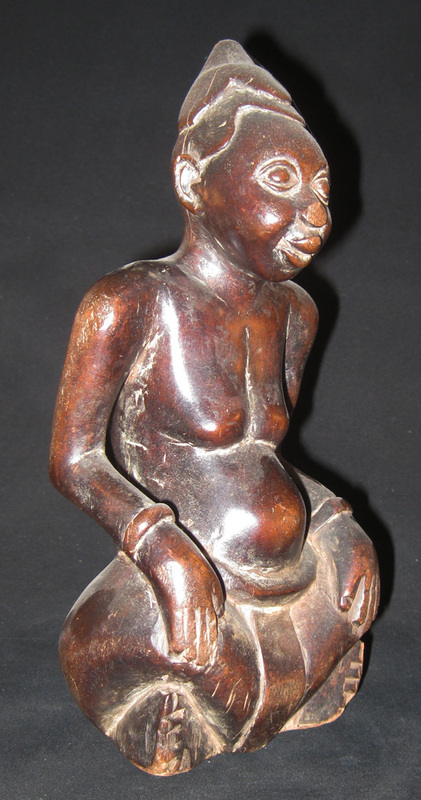 Approximately 2 3/8 inches tall and 2 inches wide, intact, excellent condition. 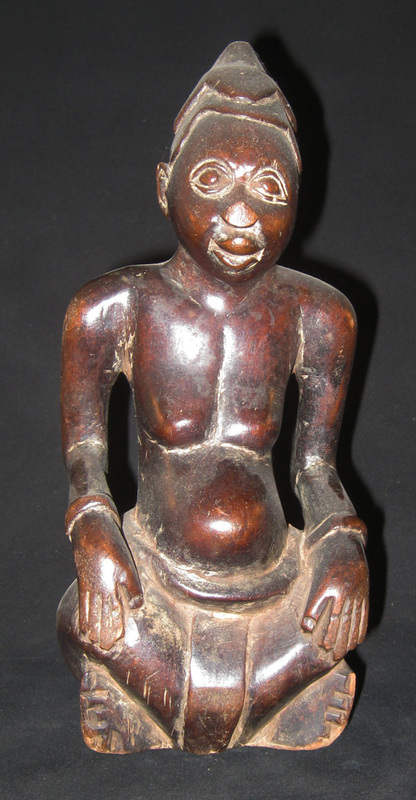 AF108 A very lovely Congo wood carving of a seated male. The man sits on his crossed legs, a serene look upon his face, the hands resting upon the knees, with a bent back and bolbous stomach. He wears a head cover appearing to be made of leaves, a bracelet at each wrist, and a belt with a skirt and loin cover. 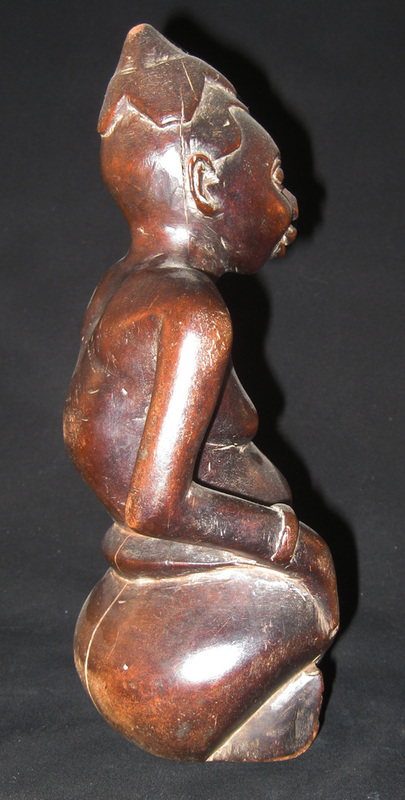 The figure is delicately carved with smooth contouring curvatures, carefully carved details of a chubby youth, almost boyish in his charm, and the rich glossy reddish to deep brown surface holds a glossy polished patina. 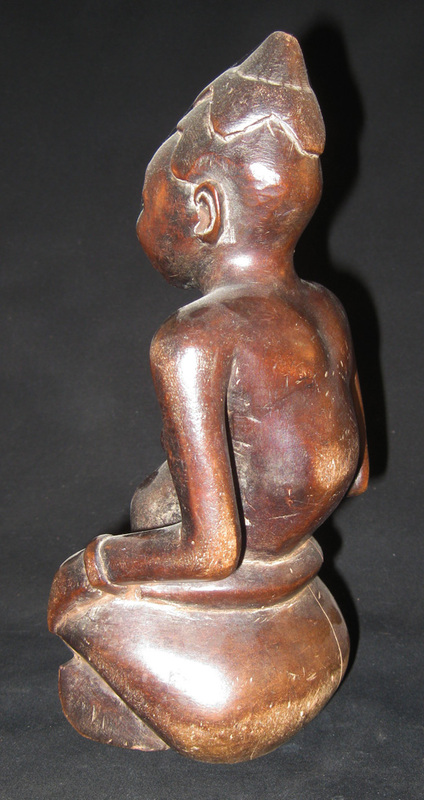 Sitting on a flat base, the image is 9 1/4 inches tall, in excellent condition with a split on the backside and another small split to right side of the head, and the end of his nose missing and well polished. 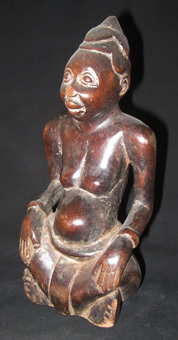 A well crafted and charming natural pose, the image is from the Congo, probably Yombe or Luba Tribe. 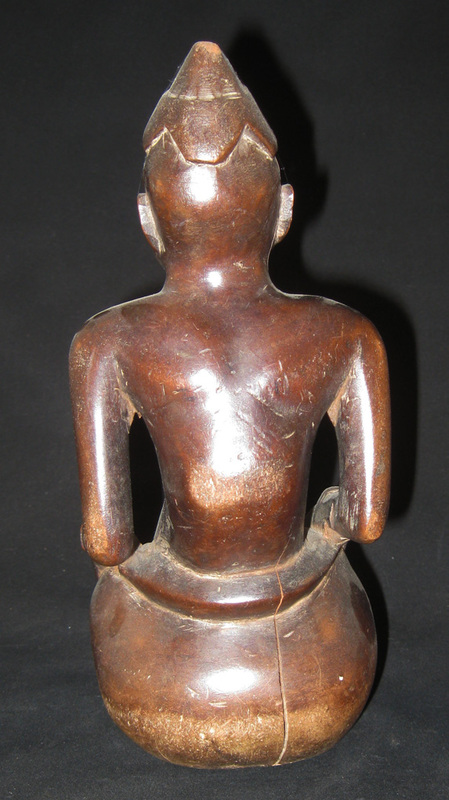 NG146 An excellent 'Talipun' from New Guinea. 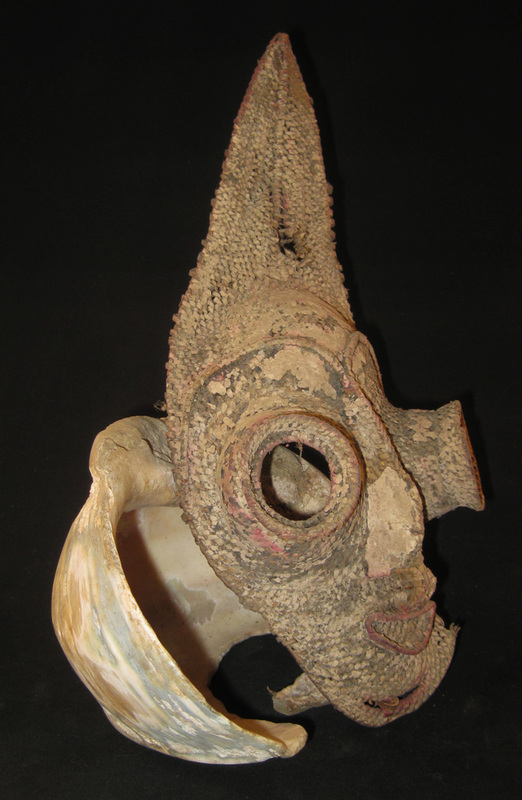 The basket mask is tied to a section of a huge spiralling opalescent shell and such tribal creations served as a monetary exchange unit. 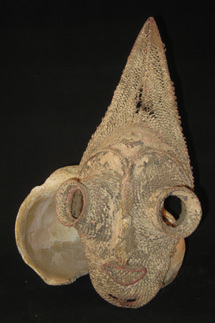 The basketry rattan mask is near lifesize featuring large protruding goggle eyes, a broad sweeping brow terminating at the end of a narrow nose, with a small attached pink colored mouth, and the head surmounted with a tall peaked pyramid. 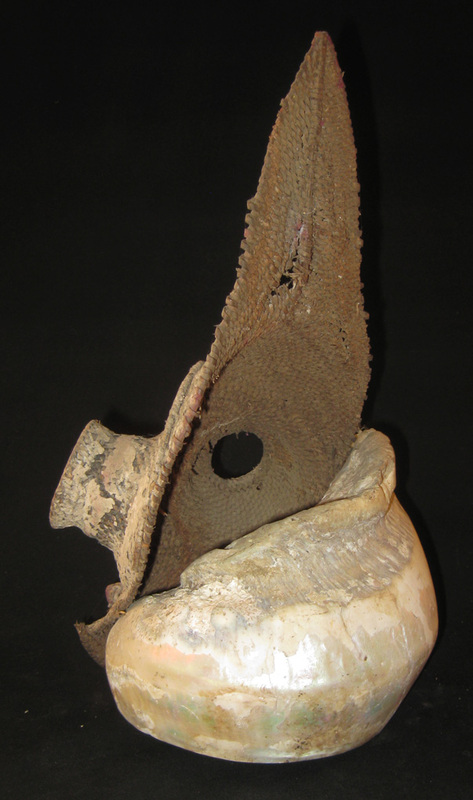 A much more sizable example than most, the mask itself measures approximately 12 inches long and 5 inches wide, and is attached with original strapping at the chin to piercings on the shell. Originally, would have been covered with pigmented clay, most has fallen away, with colors in pink and cream remaining in areas. 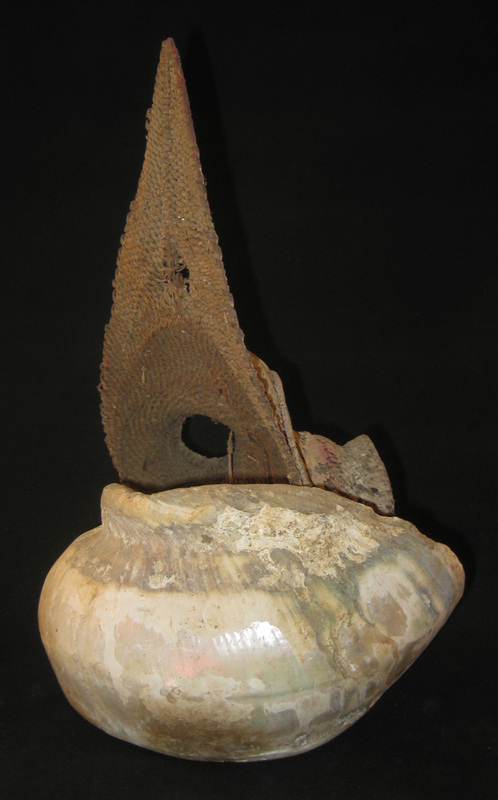 Shell, itself, is from a huge mollusc and this huge open fragment is 7 inches across and having a height of over 5 inches with most areas polished down to show a rainbow irridescence. This would be one huge snail! The tradition of the talipun is found with the Arapesh in the Toracelli Mountains of New Guinea and sometimes used as marriage dowry. Collected by Jack Edler of Indiana, US, during 1960's. ET102 A very decorative wool, probably goat's hair, floor runner with a central image of a lion and four pyramids surrounded by the city's layout. The thick blanket or rug is woven with colors in natural beige, dark coffee brown, and brownish tea hair with twisting fringe on both ends. 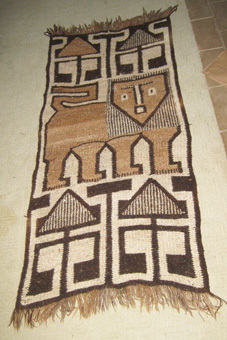 Overall in excellent condition and the weaving is double sided. 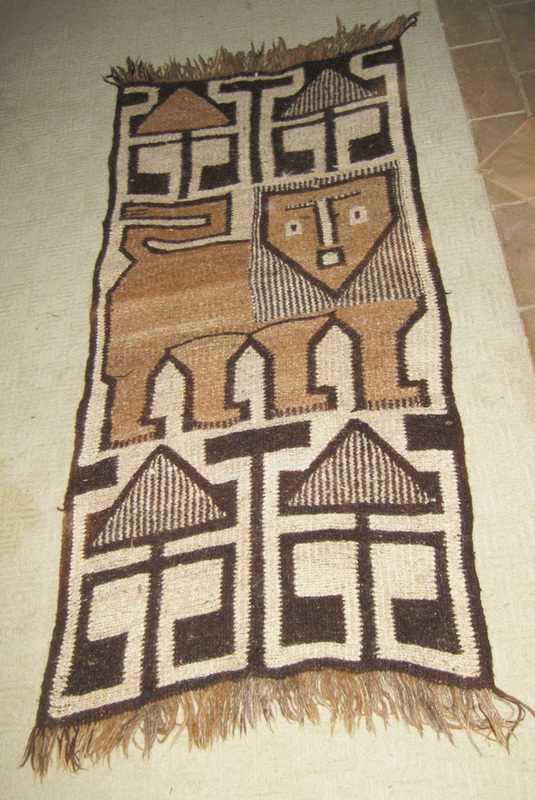 The rug was purchased from a local estate of a world traveler who acquired it, probably in the 1960's to 1970's, and I was told it was probably Ethiopian, though, most likely it is more Morroccan or Egyptian in origin. Makes a very decorative wall hanging or, could be used for the original intent, as a floor runner; due to the coarsness of fiber, not appropriate for bedding. FR106 The collection is of three wonderful Neolithic flint hammerstones from France of the Seine Basin, possibly found near Yonne or Yvelines and dating to circa 4500 B.C. to 1700 B.C. 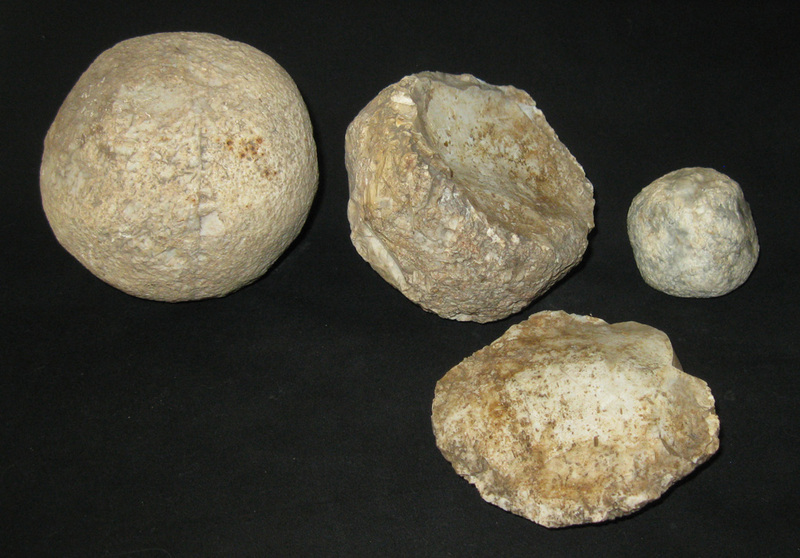 Such rounded flint stones were used for hard striking of flint and chert tools and knapping. Examples here come from a small group of Paleolithic and Neolithic tools from the famous Edward Payne Collection of Illinois, a man who had ammassed the largest private collection of Native American pre-historic relics and other world culture's relics during the 1880's through 1930's. He would frequently loan objects to The Smithsonian and have eager scholars travel long distances to study the rarities. 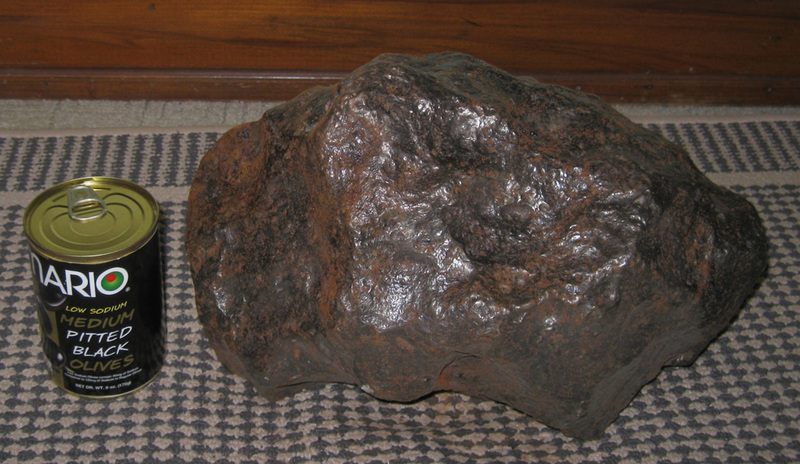 The largest hammerstone here was published in a rare short run book of his collection in the 1930's, now, nearly impossible to find, and was called a 'Game Ball' due to more familiar American relics and lack of knowledge at that time. The three pieces are definitely from the Payne Collection, kept together for more than 100 years as a group, all match quite well, so selling the three as a matching set and not to be sold individually. 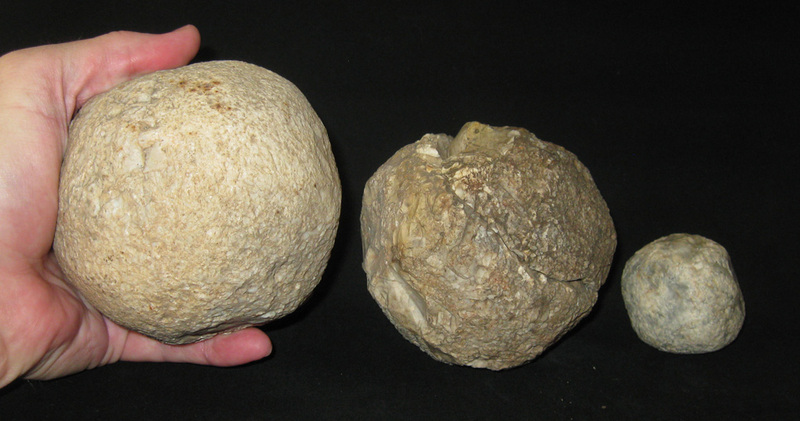 The smaller stone is approximately 1 3/4 inches (5 cm) in diameter,weighs 8 ounces, in excellent condition and more cube in form, with great patina. 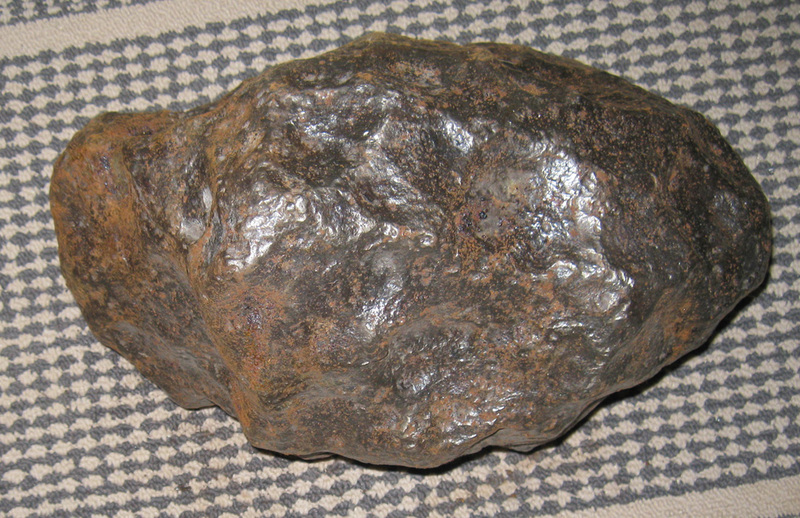 Second example is a larger example at approximately 4 inches (9 to 10 cm) in diameter, with much heavy ancient chipping, retaining a completely flattened surface from the rhind, and weighs 12 ounces. This example is split in two pieces and the parts fit perfectly together to allow one to see the inside of the core. 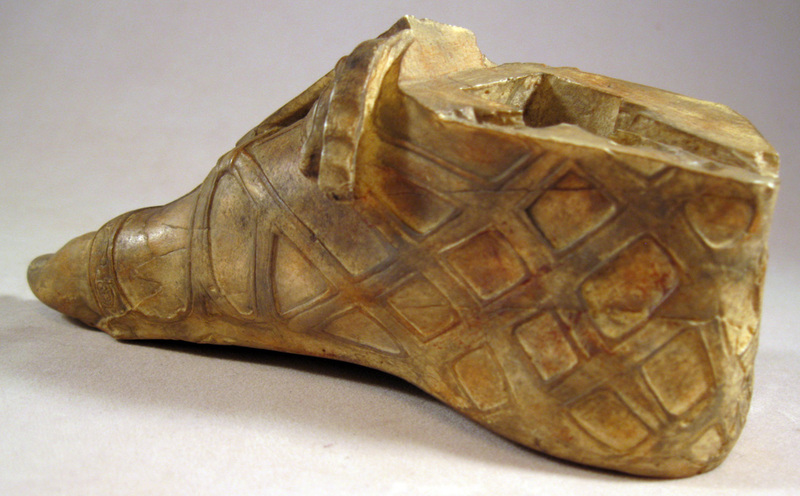 It is suggested by an expert in these artifacts, that the break is most likely a freeze breakage rather than concussion. The Third and largest example is quite magnificent and intact at larger than baseball size. Measuring approximately 4 inches (10.5cm) in diameter at largest measure, it weighs 3 pounds 12 ounces, and has some some scars from strikes on one side, otherwise excellent. 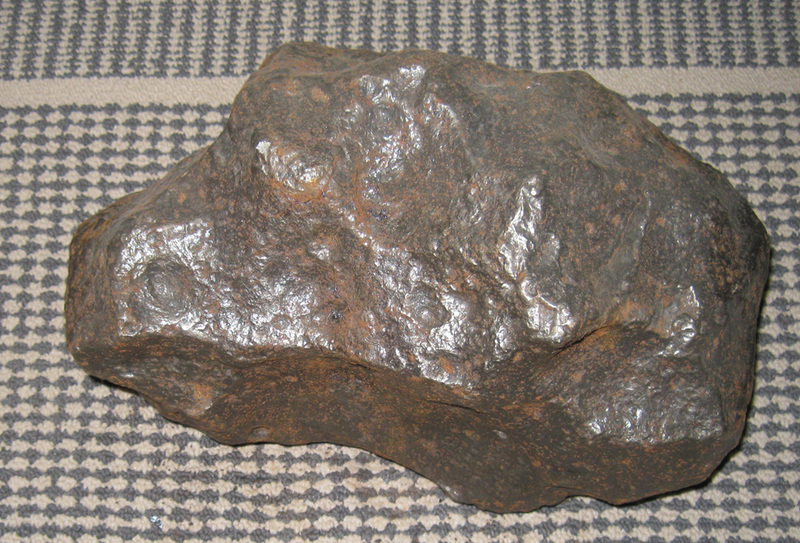 The overall surface is quite worn and smooth and suggests that this example was re-purposed for the grinding of grain. Due to the size and weight of the example, it would have easily rolled over seeds and grain, thereby, creating the more rounded and even surface. This is a fine and rare size example. 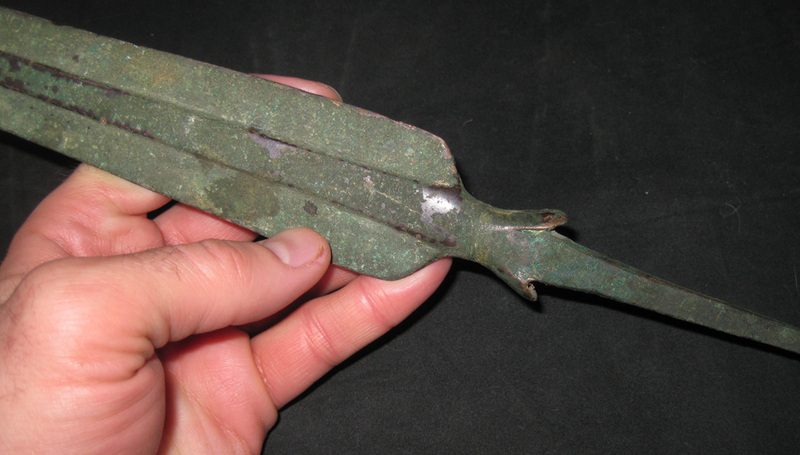 MP332 A fantastic Luristan bronze lance head or spear that is cast in strong quality bronze, thick and heavy, retaining a strong edge and in excellent condition. The example measures 16 inches long and has been lightly cleaned, showing high quality craftsmanship, and also a strongly patinated surface with verdi gris ancient surface encrusation. Weighing right at one pound, this was a menacing and devastating weapon meant to be used as a thrusting weapon and mounted into a longer wooden staff. Luristan, Iran, circa 800-400 B.C. MP333 A 'short sword' or lance of the Luristan culture and would have been hafted and bound into a wooden staff or handle. The weapon measures 18 3/4 inches long, cast in sturdy bronze, has been cleaned a bit and still exhibits strong malachite mineral growth and verdi gris patina. Intact and excellent condition, the edges are still sharp and to feel these sides, one can notice dozens of strikes and that one side expressed more defense than another, which may explain the curvature of the shaft. MP334 A huge spear or lance head of the Luristan culture, cast in heavy bronze. The example has undoubtedly, seen battle. 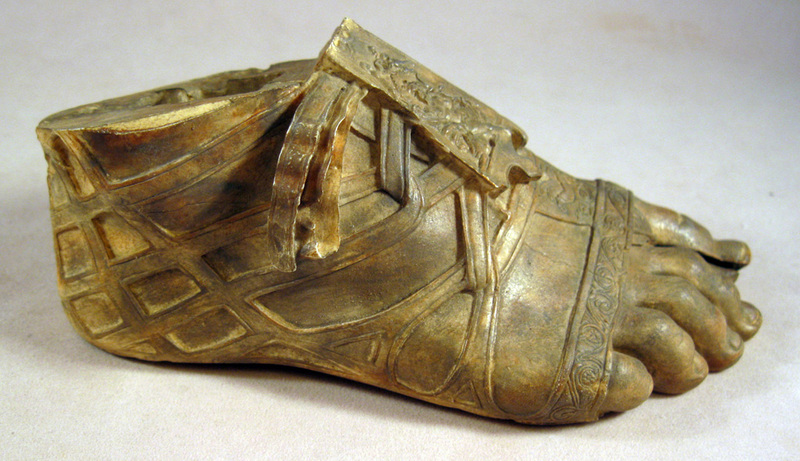 Possibly, the piece was used as a sword in confrontations, and suffers many strikes to the edges with a 1 3/4 inch missing piece to one edge, along with many more dings to the same edge, and also strikes on the opposite edge, that attest that this bronze has seen a vicious fight or many such events. 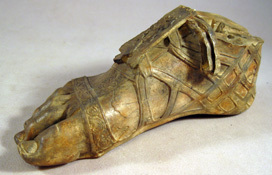 The bronze head is a large 20 1/2 inches long, large enough to possibly, have been a short sword, but, the hafted end appears too short for such support. 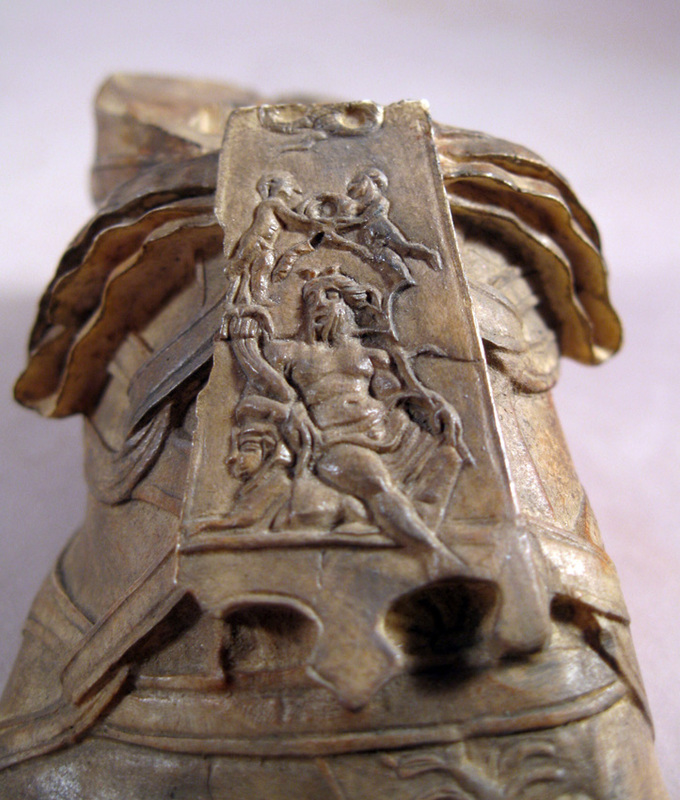 It is intact except the mentioned ancient fractured loss in battle, various sword strikes, and retains strong malachite growths and verdi gris patina. Comes with custom horizonal walnut display stand. 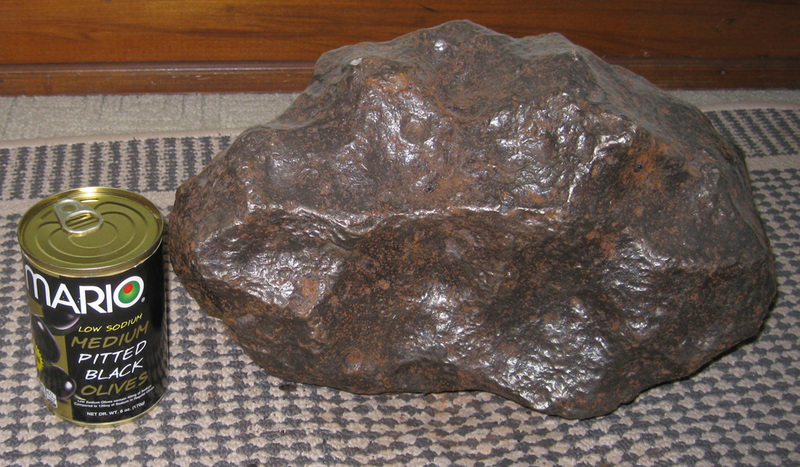 MP335 A powerful iron Meteorite weighing 112 pounds. 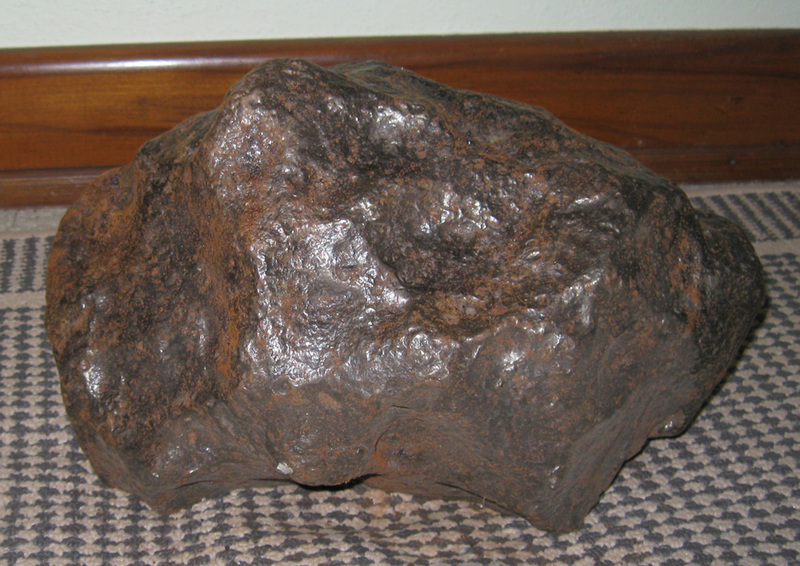 This large example of a meteorite is composed of iron and comes from the famous 'Campo del Cielo' site of Argentina, which translates into 'Valley of the Sky'. Approximately 4,000-5,000 years ago, a shower rained upon this valley and punished the area with iron meteors. This is the site where the very first meteor examples taken into the British Museum came from after early explorers were lead by the natives to see this field with scattered strange rocks. The shower pummeled the area and embedded thousands of large and small meteors inside the ground, many of the larger examples splintering off and some remaining intact. It is now forbidden to remove any of these objects from the site. 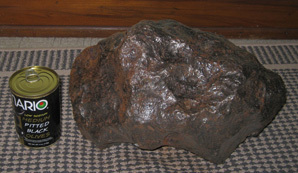 Example here is a very patinated and intact Iron, coarse octahedrite, unaltered example weighing 112 pounds and measures approximately 13 1/2, 8 3/4, and 7 1/4 inches in maximum dimensions. 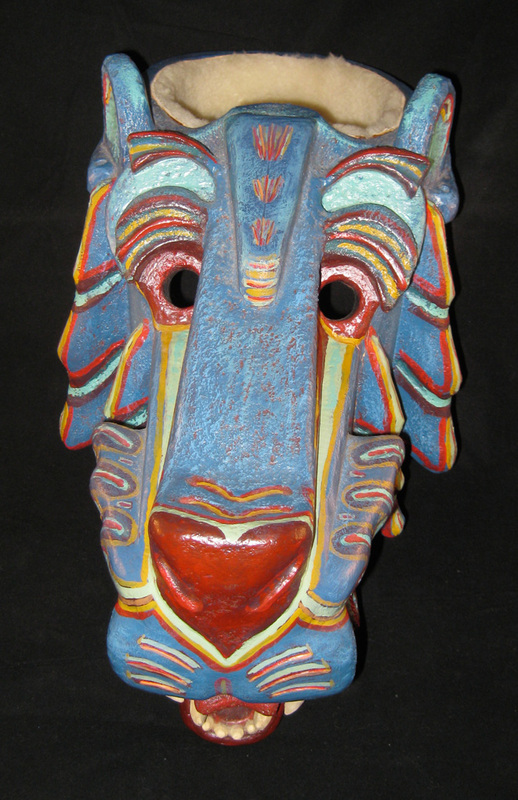 NA301 This is a highly crafted contemporary ceremonial dance mask, meant for traditional Native American dances. 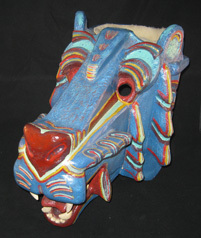 The large mask is hand carved from wood and well crafted to depict a long snouted bear with open mouth, round eyes, curling tongue, perked short ears, and tufts of fur surrounding the face. The mask is mounted with a ring on the back, lined with faux fur, and can be worn comfortably and is well balanced as the rear of the head will rest and balance against the wearer's chest. Painted in acrylics in bright blue, red, yellow, white, and green designs. Though there is no maker's signature, it was obviously crafted by a professional mask maker. It appears to be circa 1970's- 1980's and is in excellent condition. Mask measures 19 inches long, 9 1/2 inches wide, and 13 inches tall. 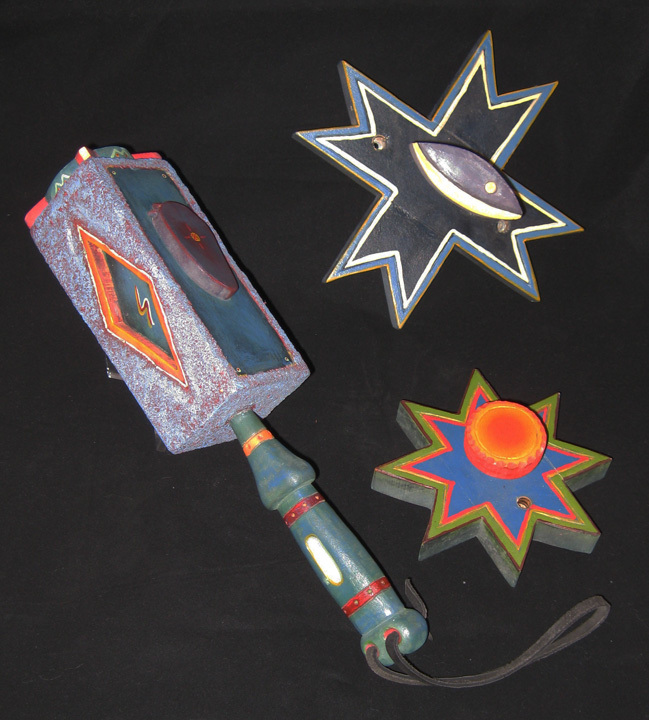 Accompanied with a matching rectangular dance rattle and two wall hangings in star shaped design.